For a scenic drive and a unique hike through a long tunnel, head to the Lake View Drive, known more commonly as the "Road to Nowhere", in the Great Smoky Mountains National Park. 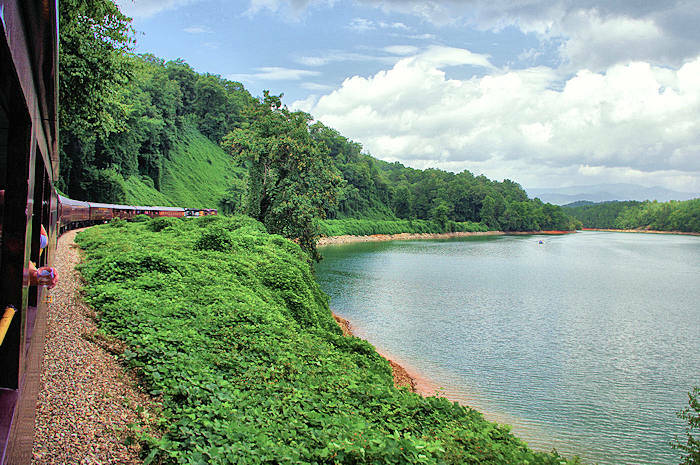 At the end of the six-mile winding road through the forest, find a network of hiking trails. 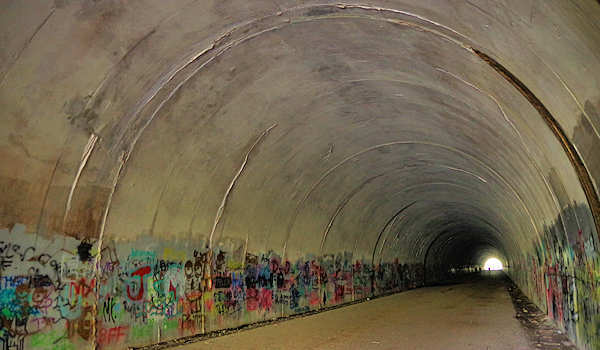 A 3.2-mile loop option starts with a walk through a 1,200-foot tunnel built for a scenic drive that was never completed. 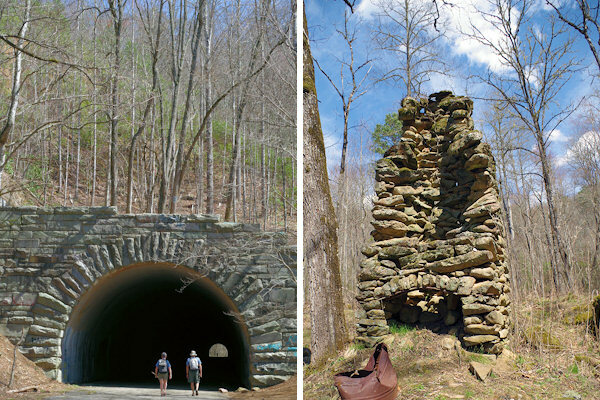 Located near Bryson City, the "Road to Nowhere" and has a long, complicated history (read below). On the hike, you'll pass some abandoned homesteads, walk along a cascading creek, and get a peek at Fontana Lake and even some wild boar traps. 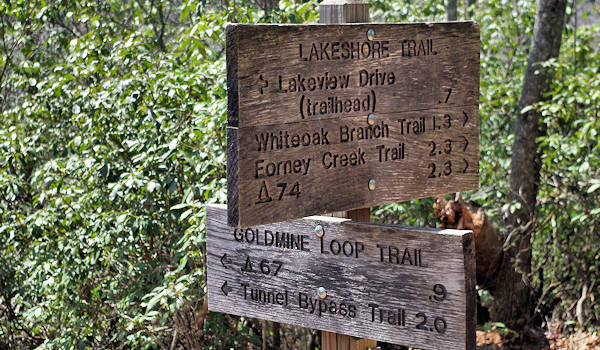 To complete the loop, you'll hike three trails: Goldmine Loop, Lakeshore and Tunnel Bypass. A side trail takes you to backcountry campsite No. 67 at the location of an old homestead. Find a nice network of trails and some remote campsites. From the parking lot at the end of Lakeview Drive, walk the paved road through the tunnel (you'll immediately see the tunnel). On sunny days, you can make it through ok without a flashlight. So take a light along, especially if you don't like dark spaces! There are no lights in the tunnel and there is some debris like small piles of leaves inside. It's a great winter hike option since it usually only snows a few days. 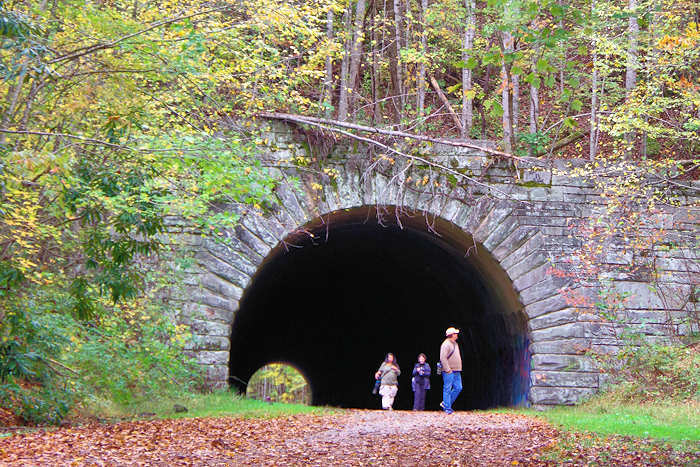 On the other side of the tunnel, the pavement ends and the Lakeshore Trail begins (it continues for 35 miles to Fontana Dam!). The Goldmine Loop Trail starts about a half mile past the tunnel on the left (look for the sign). Pass the first trail on the left, the Tunnel Bypass trail that takes you to campsite 67. A short distance beyond is the Goldmine Loop Trail on the left. Turn here and head down a ridge to an old homestead with the remains of the chimney. From there, continue on to follow a cascading Goldmine Branch through a forest. In about a half mile, you see the other end of the trail to campsite 67 on the left. Continue straight ahead along the branch for another quarter mile for to a view of a cove of Fontana Lake. From there, take the trail uphill for a long and strenuous climb. In about a mile, you'll reach the intersection of the Tunnel Bypass Trail (and the end of Goldmine Loop Trail). Bear right at sign that says "parking 4/10 of a mile" to return to parking area. Or for a longer way back, turn left on the Bypass Trail to return to the Lakeshore Trail and walk back through the tunnel. The "Road to Nowhere" is quite a saga. 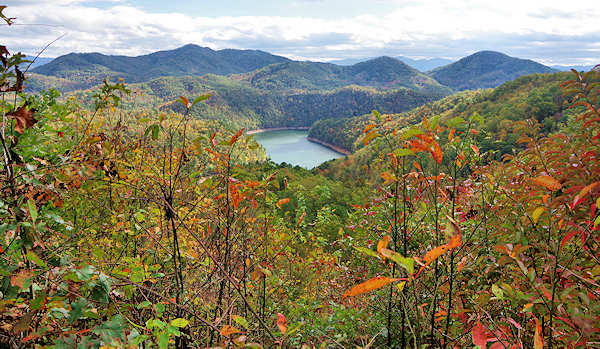 Here's a very brief version: After the original Highway 288 was buried under the waters of Fontana Lake in the 1940s, the National Park Service promised to reroute the highway along the north shore of the lake through the park. The lake project displaced more than a thousand families and cut off access to family cemeteries. Construction of six miles of the road was completed in the early 1970s. But environmental issues stopped construction and started years of debate about completion. 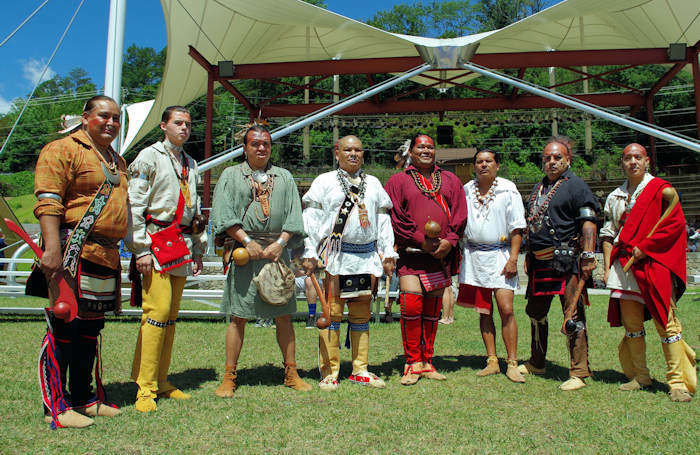 In 2010, the project was finally put to rest and Swain County accepted a $52 million payment from the federal government not to complete the road. Families can access the cemeteries by water for "Decoration Days" to clean cemeteries and to place flowers. Fontana Village Marina offers transportation by pontoon shuttle on several days throughout the year. Why the wild boar traps? A local farmer brought a couple of dozen boars to his hunting ranch in the early 1900s and several escaped into the mountains. A few are still believed to be in the area and wildlife officials are trying to remove the destructive species. From downtown Bryson City, drive Everett Street from U.S. 19 past the depot. Out of town, the road becomes Fontana Road. 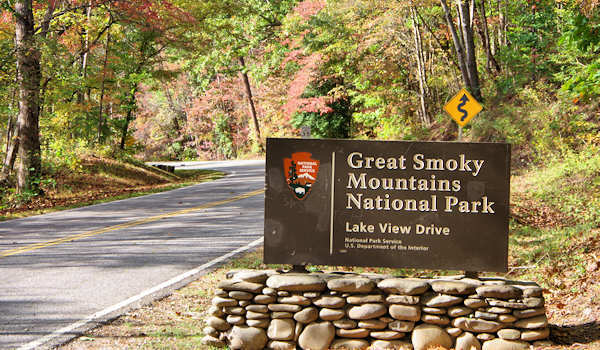 In just a few miles, you'll see the Great Smoky Mountains Park sign that marks the beginning of the Road to Nowhere, officially called Lake View Road. Continue six miles through the park to the end to find the parking area near the tunnel.